GNU Octave is a high-level language, primarily intended for numerical computations. The package is open source and can be freely distributed. 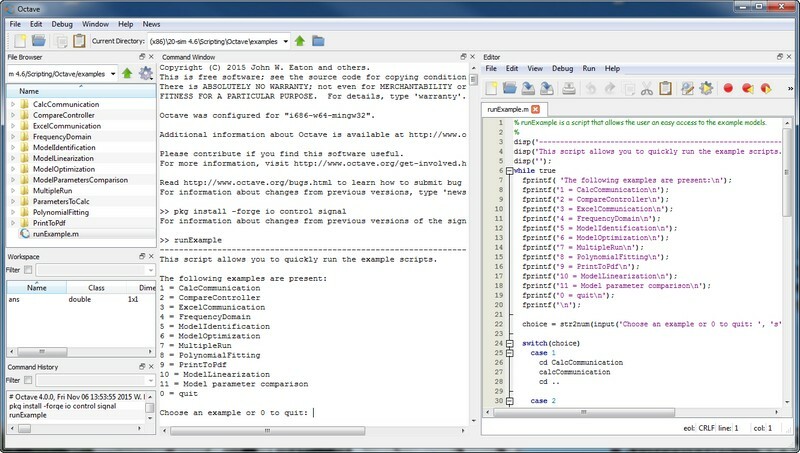 GNU Octave offers functionality similar to Matlab users. If you have experience with Matlab, running Octave will be very easy. Users with no experience with Octave nor Matlab are advised to read a proper introduction to GNU Octave first. You will find lot of pages and videos on the Internet. The Windows versions of Octave 4.4.0, 4.2.x, Octave-4.0.x, Octave-3.8.x, Octave-3.6.x have been tested with 20-sim scripting at the time of this release. Note that for most versions of Octave only the 32-bit Octave is supported. 64-bit versions of Octave are supported since Octave 4.2.1. 1. Go to: https://www.20sim.com/product/octave.html and follow the latest instructions. 3. Run the installer and follow the wizard. The steps below assume default installation settings. 4. Octave 4.0.x only: Unfortunately Octave 4.0.x has a Windows specific bug in its internal run() function. This bug is resolved in Octave 4.2. Your Octave installation is now ready to use. 2. Run the installer and follow the wizard. 1. Go to the Octave download site (http://sourceforge.net/projects/octave/.). 2. Click on the Files tab and click on Octave Windows Binaries. 3. Select the Octave 3.6.4 for Windows MinGW installer. 4. Now you can download the files Octave3.6.4_gcc4.6.2_yyyyxxxx.7z (Octave Installation) and Octave3.6.4_gcc4.6.2_pkgs_yyyyxxxx.7z (Octaveforge Packages). 5. Create an installation directory which doesn't have space chars (i.e. C:\Octave). 6. Unzip the file Octave3.6.4_gcc4.6.2_yyyyxxxx.7z and copy it to the installation directory. 7. Copy the shortcut link C:\Octave\Octave3.6.4_gcc4.6.2.lnk to your desktop. This is a shortcut to start Octave.exe. Note: There is a bug with Windows 8 and running Octave. In order to use Octave start Octave with octave.exe -i --line-editing. See the Octave wiki webpage for more information. 8. Unzip the file Octave3.6.4_gcc4.6.2_pkgs_yyyyxxxx.7z and copy it to the installation directory. 9. Launch Octave (e.g. the link to Octave.exe). 11. Close and restart Octave.